Caron Chiropractic Clinic is located in St. Paul, Minnesota at the intersection of Randolph and Snelling and in a new location in Village Center Shopping Center in North Oaks, Minnesota. We opened our St. Paul Clinic in 1992, and our North Oaks Clinic in 2013. One of the common injuries that our clinic has treated over the years is whiplash. In car accidents there are many other types of injuries that our clinic has treated successfully, but whiplash is the most common. There is a formula we have used over the years when treating someone who has been injured in an auto accident. The first is having very thorough initial intake and health history forms. This is followed up by an extensive history, exam and x-rays. Each one of these steps is critical in coming up with a very specific diagnosis of all the obvious injuries and not so obvious or hidden injuries. The importance of this step, and why our clinic has done well in caring for car accident victims is a specific diagnosis allows us a very specific treatment plan to help resolve these difficult injuries. The most common diagnoses are sprain/strains of muscles and ligaments. If these injuries are left untreated, they can heal with scar tissue. Scar tissue has many pain nerves and can be a common source of sensitive tissue and chronic pain. Treatments such as trigger point therapy, active release technique, massage, laser therapy, ultrasound, electronic muscle stimulation and specific exercise rehab can minimize scar tissue formation and help resolve soft tissue injuries. Chiropractic subluxations and/or joint dysfunction also are very common injuries. Examination and x-ray findings can be very important in specifically diagnosing these injuries. These subluxations most commonly occur in the spine, but also occur in shoulders, wrists, jaws, pelvises, hips, knees and ankles. Our clinic prides itself in checking each joint of the body for these subluxations. We use multiple chiropractic techniques with our adjusting to help resolve these subluxations. These subluxations left untreated will turn into arthritis and chronic pain. Our clinic’s philosophy is to treat each patient individually with care and respect. Every person who is involved in a car accident has unique circumstances involving themselves and the car crash. There are so many different variables with each unique patient, and it is an important to be very thorough when they are being treated at our clinic. We use many other health professionals, and referrals when helping our patients. This is very important in many cases involving auto accident injuries. If you or a loved one have the misfortune of being involved in a car accident, Caron Chiropractic Clinic would be an excellent choice in helping you recover. 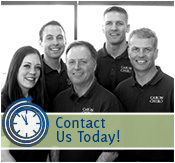 We have over 50 years of experience, and are experts in treating these types of cases. This entry was posted	on Thursday, January 2nd, 2014 at 10:11 pm	and is filed under Auto Injuries, Chiropractic Treatments, Whiplash. You can follow any responses to this entry through the RSS 2.0 feed. You can leave a response, or trackback from your own site.